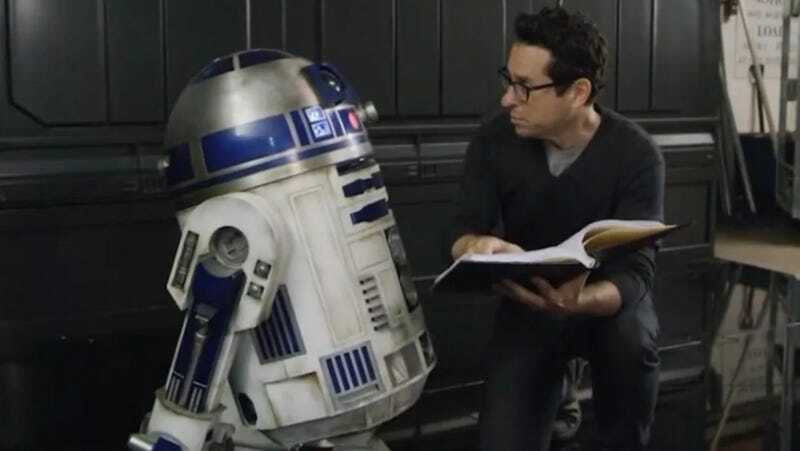 J.J. Abrams with R2-D2, who we assume is in Episode IX. Directing any movie is a big deal, but directing a Star Wars movie is an even bigger deal. So that makes directing what’s being billed as the ninth and final film in the the original Star Wars saga something so gigantic few of us can even fathom it. That’s not lost on the person responsible for that monumental task, J.J. Abrams, who previously made Star Wars: The Force Awakens. In a new interview with Fast Company, the co-writer and director of Star Wars: Episode IX spoke at length about deciding to come back to the franchise, and how he slowly realized just how enormous this film, in particular, was going to be. It was a completely unknown scenario. I had some gut instincts about where the story would have gone. But without getting in the weeds on Episode VIII, that was a story that Rian [Johnson] wrote and was telling based on [Episode] VII before we met. So he was taking the thing in another direction. So we also had to respond to Episode VIII. So our movie was not just following what we had started, it was following what we had started and then had been advanced by someone else. So there was that, and, finally, it was resolving nine movies. While there are some threads of larger ideas and some big picture things that had been conceived decades ago and a lot of ideas that Lawrence Kasdan and I had when we were doing Episode VII, the lack of absolute inevitability, the lack of a complete structure for this thing, given the way it was being run was an enormous challenge. There was also the fact that Abrams was being asked to fill in for Colin Trevorrow, who had been working on the film for several years and then was let go, giving Abrams only two years from blank page to release date. So he brought in writer Chris Terrio—who, Abrams explained, added a whole new perspective he desperately needed. Because I had been through the process, and I was looking at brass tacks: “This is what it’s going to take, this is the reality of it.” And he was looking at it sort of childlike: “Oh my God, I can’t believe we get to play in this world,” which I needed to be reminded of. I needed that point of view, because that’s not where I was. Of course, I was excited about what we could do, but I was acutely aware of how little time we had to do a fairly enormous job. Add all that up and it seems like Abrams may have bit off more than he could chew. Thankfully, though, now that filming is done he has a very good feeling about it. I feel like we might’ve done it. Like, I actually feel like this crazy challenge that could have been a wildly uncomfortable contortion of ideas, and a kind of shoving-in of answers and Band-Aids and bridges and things that would have felt messy. Strangely, we were sort of relentless and almost unbearably disciplined about the story and forcing ourselves to question and answer some fundamental things that at the beginning, I absolutely had no clue how we would begin to address. I feel like we’ve gotten to a place—without jinxing anything or sounding more confident than I deserve to be—I feel like we’re in a place where we might have something incredibly special. By the end of this week, fans will get a first glimpse of what special things Abrams has in store. He’s expected to unveil the title and first teaser trailer at Star Wars Celebration Chicago on Friday, April 12. Head over to Fast Company to read even more from Abrams about Star Wars, as well as Bad Robot, Apple, and more. Star Wars: Episode IX opens December 20.